Information on State of birth was derived from answers to the question, "Where was this person born?" For persons born in the United States, the State of birth was requested; and for persons born outside the United States, the foreign country or outlying area of the United States. Presumably, the inquiry on State of birth relates to present State boundaries. No definite instructions to this effect, however, were given the enumerators. This uncertainty would have more effect on older persons and on the figures from earlier censuses. In 1950, for the first time, the enumerators were specifically instructed to record the State of the mother's usual residence in the case of an infant born in a hospital rather than the State in which the hospital was located. This instruction was repeated in 1960. It is likely that it was often ignored. Most of the differences In the usual place of residence of the mothers and the location of the hospitals are intrastate, and, therefore, do not affect the statistics. Residence on April 1, 1955, is the usual place of residence five years prior to enumeration. The category "same house as in 1960" includes all persons 5 years old and over who were reported as living in the same house on the date of enumeration in 1960 and five years prior to enumeration. Included in the group are persons who had never moved during the five years as well as those who had moved but by 1960 had returned to their 1955 residence. The category "different house in the U.S." includes persons who, on April 1, 1955, lived in the United States in a different house from the one they occupied on April 1, 1960. This category is subdivided into three groups' according to their 1955 residence, viz., "different house, same county," "different county, same State," and "different State." The category "abroad" includes those with residence in a foreign country or an outlying area of the United States in 1955- (In the coding of this item, persons who lived in Alaska or Hawaii in 1955 but in other States in 1960 were classified as living in a different State in 1955.) Persons 5 years old and over who had indicated they had moved into their present residence after April 1, 1955, but for whom sufficiently complete and consistent information regarding residence on April 1, 1955, was not collected, are included in the group "moved, place of residence in 1955 not reported." (Missing information was supplied if data were available for other members of the family.) 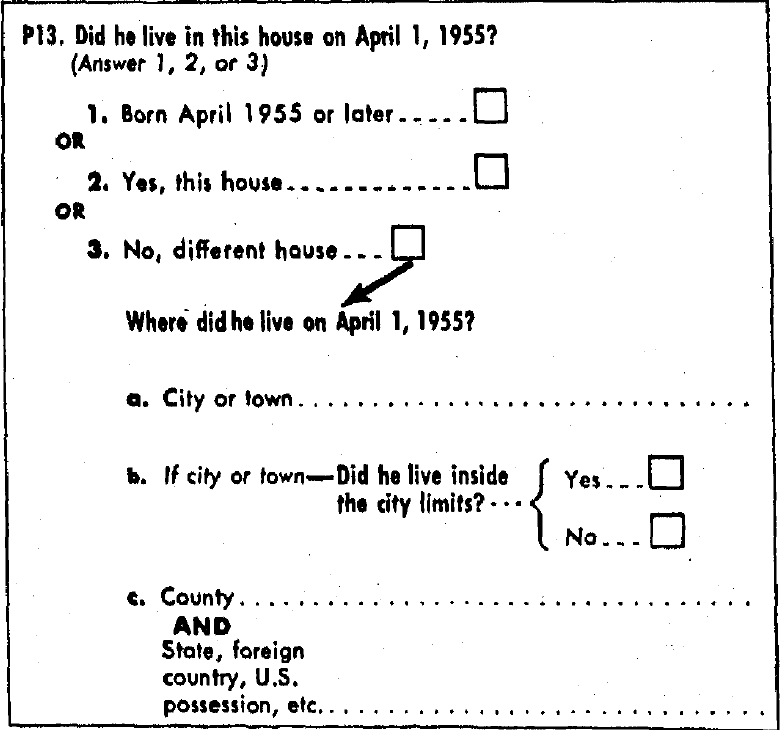 Also included in the category "moved, place of residence in 1955 not reported" are persons who gave no indication as to their movement since April 1, 1955, but who, on the basis of the final edited entry for year moved (for which all nonresponses were replaced by assigned entries), were classified as having moved into their present house since April 1, 1955- In the present report, nonmovers and intrastate movers are combined into the single category "same State." Interstate migrants, "different State", are classified in some tables according to their geographic division of residence in 1955.